Are you in the market for a new fence? Or are you looking for repairs? Don’t worry, Roots Landscaping is Brewster’s go-to fence installation and repair company! Our team of professionals have completed numerous fencing projects, so we have the expertise to assist you in any kind of job. No matter the size of the job, we can provide our services to any client. 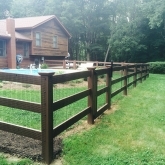 As members of the American Fence Association, we are a group of professionals that provide proven results built on quality and effort. Roots Landscaping is here to help you with any installation or repair needs. We have a number of different options for you to choose from, but first, you need to consider a few things before deciding. 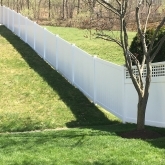 One of the biggest factors on your choice is, why are you getting a fence? Is it for privacy, security, noise reduction or safety precautions? After you’ve decided on the reason for your purchase, we can tell you what works best! 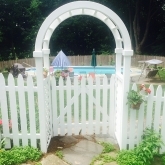 Roots Landscaping is here to help Brewster businesses and residents with any fencing project. 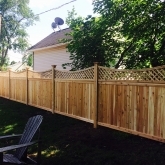 Roots Landscaping has expertise in multiple types of fences. Remember, it is important that your fence is only installed by experienced professionals, especially when it comes to obstacles. 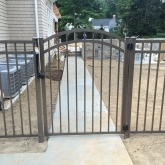 To ensure that your fence is installed properly, we first decide on which kind you are looking to install. After, we measure the area you are looking to secure, analyze the terrain, and make sure that your fence is installed correctly. 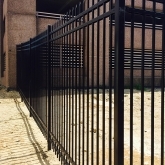 The cost of your installation will depend on the height of the fence, material and length. Lots of people mistake the wear and tear of fences to be a reason to replace an entire fence, but that’s not the case. Instead of overspending, Roots Landscaping can help you save an old fence from things like deterioration, weather and so on. Our experts will discuss with you what kind of repairs you need and ways to maintain your fence. A common problem with food fences is rot. This is caused by fungi eating at the wood and natural elements like rain, sleet, snow and other debris. Roots Landscaping can help you treat this problem, either by repairing patches or replacing certain boards. There are also chemical treatments that can help seal and protect the wood from further problems. Instead of replacing your entire fence, we can replace one or two main poles that will help with the durability of your fence. We properly measure the pole and inspect any obvious reasons to why the pole cannot stand up, then we will fix the problem. There are a multitude of reasons why holes and cracks can form in your fence. Materials like wood, vinyl, chain and aluminum need to be handled with a specific type of expertise. 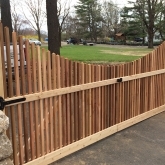 Our trained professionals at Roots Landscaping have the tools and expertise to fix any kind of fence. In need of a repair or installation of a fence today? 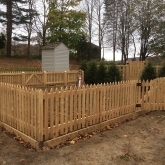 Why not work with Brewster’s top rated fence contractor, Roots Landscaping! We provide low prices and handle projects of all sizes. Someday you may want to sell your home, and a top-quality fence can really make a difference of the value of your entire property. Are you looking for privacy and security? There are lots of different reasons to purchase or repair a fence, and we can help you with all of them. Call us today for a quote!